This 90 hectare coupe was logged over the past seven months, while talks have been occurring between industry and some conservation groups. The State and Federal Government gave the go ahead to log in parts of the 430,000ha area that was supposed to be under moratorium. 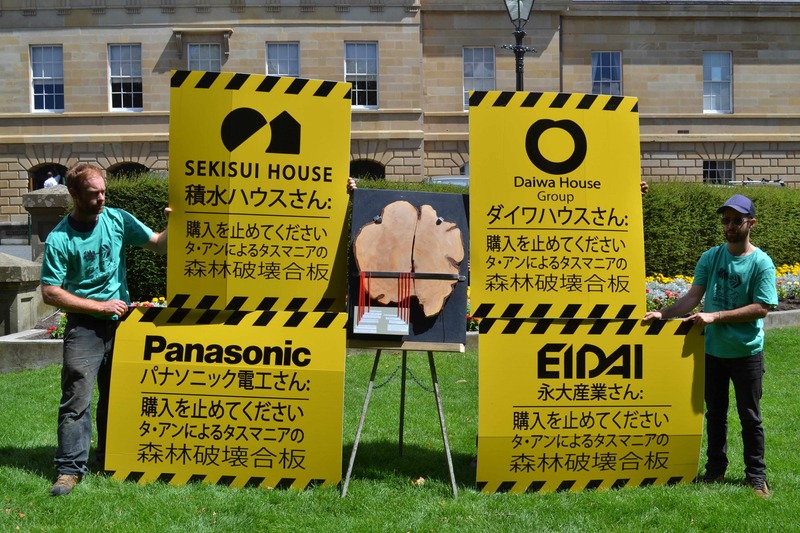 The Prime Minister promised these old growth and high conservation value (HCV) areas should be protected but because of pressure from Ta Ann and Forestry Tasmania, some of these forests have been lost, PC024B being one such tragic loss. In February, Huon Valley Environment Centre released a sample of a celery top pine from PC024B which is believed to be more than 250 years old. This sample of celery top pine clearly demonstrated that the forests being logged in the PC024B were part of an old growth ecosystem. Ta Ann has made public claims that this forest is regrowth, as a result of a wildfire In 1934. [v] However, sections of this coupe were mapped as old growth forest during the Tasmanian Regional Forest Agreement process. 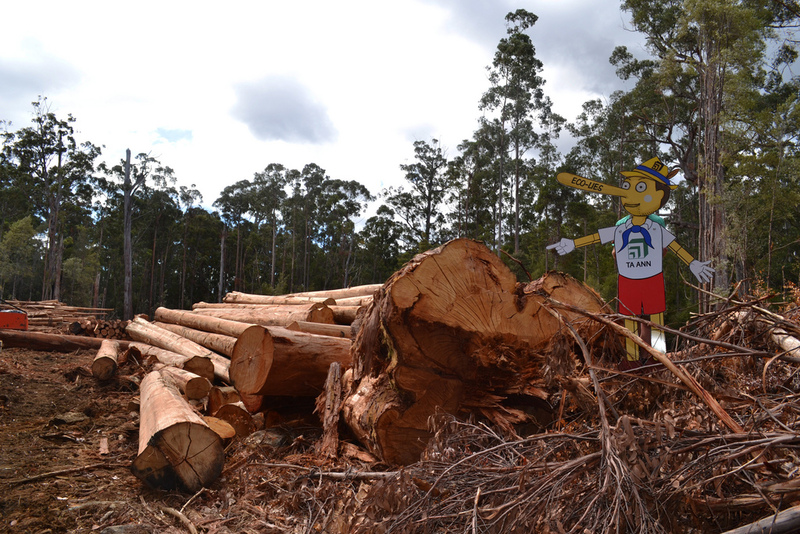 Ta Ann Tasmania public relations material emphasises that they mill regrowth logs. This implies incorrectly that there are no adverse environmental impacts associated with their operations. It is not true that regrowth logs will always originate from regrowth forests – old growth forests can contain regrowth elements as a result of the dynamic ecology of these forest ecosystems. PC204B in the Picton Valley is within 2km of a karst system that has indigenous and environmental values of international significance. [vi] This karst system contains evidence of the human societies living in this region, which were the most southerly known peoples on earth during the last ice age. [vii] This karst system is located in the World Heritage value forests of the Middle Huon Valley. PC024B is located at the entrance to the Middle Huon Valley. Now that this area of forest has been logged it will need to be added to the area of disturbed forests in the Picton Valley that require restoration. As Peter Hitchcock stated, “a holistic long-term view was taken in establishing the contribution that the areas can make to conserving tall eucalypt forest and associated ongoing natural processes. Some rehabilitation will be necessary to restore the ecology of the area in the longer-term”. [xi] Sadly, there are areas in the Picton Valley that could have been protected as intact tall eucalypt and rainforest ecosystems instead, if logging operations in these magnificent areas had been halted over the past few months. [v] Ta Ann Tasmania (2012). “Response to Cyber Attack”. Ta Ann Tasmania website. http://www.taanntas.com.au/default.aspx?page=f7573d54-6220-4669-b5c3-eceb759ea123 Last accessed on 26 July 2012. Posted on July 27, 2012, in A Forest A Day. Bookmark the permalink. Leave a comment.